The nine lives of Rauno Tahvonen are over. The Estonian crowd favorite survived multiple all-ins miraculously, but as he remained super short it had to end at one point. Tahvonen shoved :::Ac:::Js under the gun for less than two big blinds and got three callers, including Francis Foord-Brown with :::6s:::6h. 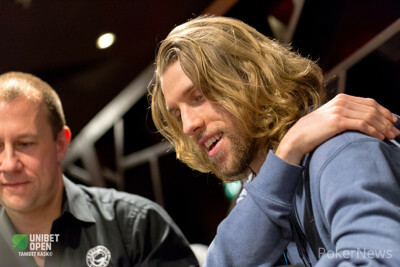 The flop was :::Kh:::Qs:::6d and Foord-Brown bet 275,000 to get the other players out. The Twitch rail begged for a ten for their hero, but the :::4h on the turn and :::7s on the river failed to deliver. Tahvonen’s run ended in 6th place, turning his €10 investment into £13,650.